Commercial Sign Supplies in Bulk Save Money! These Sign Supplies are Window Dressings! Buy Sign Making Kits Online from the Industry Leader at Wholesale Prices! 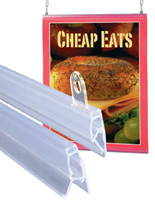 This sign supply is a durable banner hanger constructed of a strong plastic. 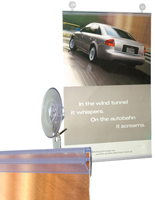 These sign supplies are easy to use vinyl banner displays. This sign supply is becoming more and more popular as company after company opts for this type of window display. 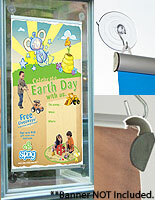 This sign supply features two rails with suction cups that hold a banner tight against any storefront window. 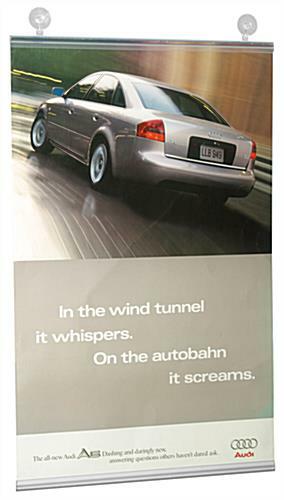 Grab the attention of customers with full-length banners in your window display! These sign supplies are even perfect to hang on your front door where everyone will see them! This sign supply may also be hung from the ceiling virtually anywhere in a showroom. Grocery stores, department stores, small retail shops, restaurants, schools and libraries are all turning to this type of sign supply to get a message out. Keep customers, students, and visitors informed about special events, daily specials, and more with these wonderful sign supplies! 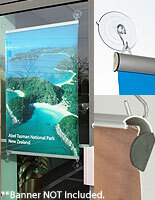 These commercial sign supplies on sale at discount prices make in-store advertising easy! Top Rail with two (2) attached eyelet clips. The adjustable clips slide to where you need them. 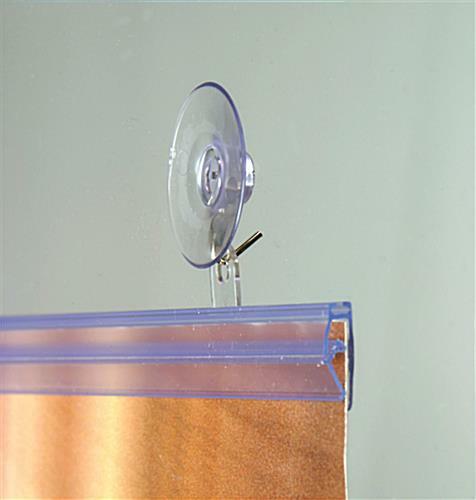 (2) 1 3/4" diameter suction cups with hooks for hanging. Bottom rail that holds your poster or banner flat and taut. Our sign supplies with suction cups are the perfect choice for window displays. These ready to ship sign supplies for sale online tightly hold 22" posters or vinyl banners.